I just received an email about a deal on Compression socks. I did not buy mine from this site or deal, but thought I would share in case you were looking at buying a pair and wanted to get a deal. It is from Gear Buzz and I receive emails all of the time about different work out oriented things on sale and discounted via the deal of the day. Posted in Body in motion and tagged compression socks, deal of the day, running. Bookmark the permalink. 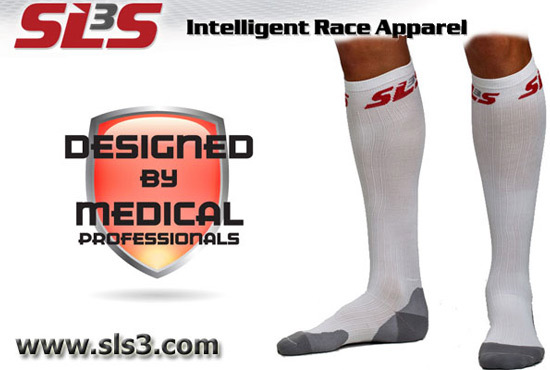 This may be a really dumb question, but how do compression socks benefit you? I honestly cant stand running long distances, but according to my Aunt I sold my soul and I have to start training for a half marathon in November. So I am creeping on your adventures of being a distance runner! This may sound really really dumb but they leave my legs feeling like I have not ran at all… I am going to start wearing them at stock shows also. I can be on my feet all day after running 10 miles and the next day I feel fine. No aches, pain or anything. I think it is the compression in the socks that keep the blood flowing whether you are standing or sitting and therefore your legs do not get stiff and tight muscles. I didn’t believe it until I wore them. Which half are you running?? Awesome, thought I may have to invest in a few pairs and get my sister some! She has been having some issues with her legs and knees since running her first half in November. We are going to fun the Seattle Half Family, it’s the weekend after Thanksgiving. You only wear them for recovery, right? You dont run in them?? Some people do, I get really hot while running so I have not yet but I might try it. PS.. thank you for your blog post. i know you are a busy busy lady!